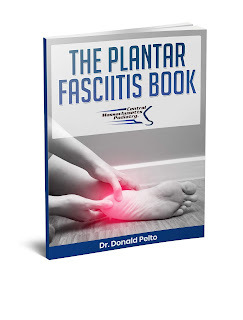 Dr. Pelto's Blog: Big bunion and curved toes. Big bunion and curved toes. Here’s an example of patient, you can see the x-ray there, with a very large bunion and you can see just by the L where it signifies the left foot, there is a big bump. 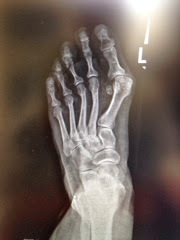 That is a bunion and there is a big space between the first and second big bones. You see those two little circles underneath the big bone, those are called sesmoid bones. Those two circles are actually where that bone that shifted over is supposed to be. So the whole goal of bunion surgery is to shift that over, but you also notice that there is some curving of the bone and that curving needs to be corrected. You need to move that whole head of that bone back over on top of those two little circles, and so that requires a pretty aggressive bunion surgery to take care of this patient.